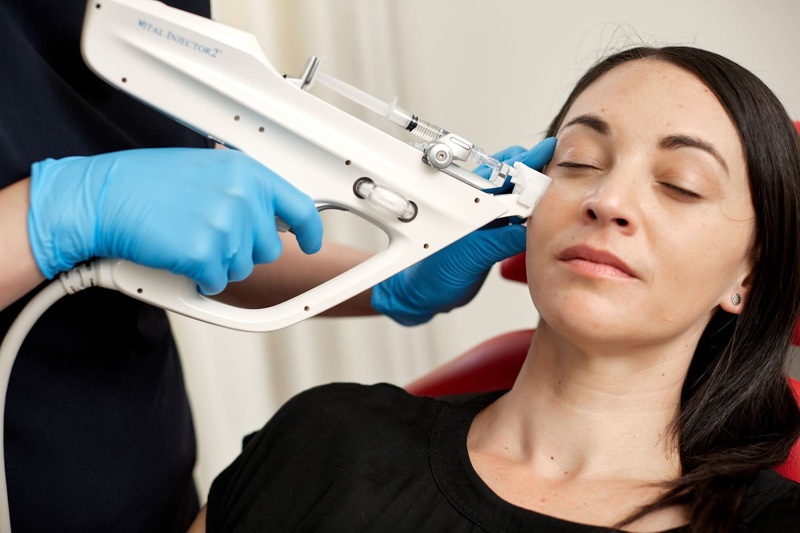 The idea of using a dermastamp or gun and needling to push product into the skin has been around for some time now, and elicited some great results for many in terms of hydration. What about if you could take that concept to the next level however, and deliver some seriously transformative results? Skin that is “plump, hydrated and younger looking” is what Clinic 42 is offering with their Photo Finish skin treatment, which I have tried and was completely blown away by. Delivering a special blend of botulinum toxin (AKA botox) and hyaluronic acid to the skin using the latest technology, it’s a Clinic 42 only treatment and super effective when treating the face or neck and décolletage. The visible results last for between 6-18 months at a cost of $1,100 per treatment, and the result I had really was remarkable. Designed to improve crepiness, fine lines, skin texture and the size of pores, the Photo Finish treatment has little down time, with only mild redness and possible bruising visible immediately afterwards. I had one to treat my neck and décolletage after a summer in the sun, and it was the perfect treatment to help match the texture of the skin on my face to what lay below, which isn’t always as well shielded. In the procedure, thin hyaluronics are mixed in with a mini-dose of the botulinum toxin, and when combined, they moisturise the skin from the inside out while simultaneously smoothing fine lines and minimising pores. After numbing cream takes effect (an essential IMHO), the product is administered using a dermal gun to the entire area being treated, which can be the entire face, neck and décolletage or back of hands. The mix is planted very superficially, just under the skin, where the hyaluronics attract moisture, so the skin becomes smooth and elastic from the inside out. The botulinum is in such a small dose that it does not impact on the facial muscles themselves, so no ‘freezing’ effect comes into play if you’re botox-shy. What it does do is relax the most superficial lines and wrinkles, softness assured. The output of sweat and sebaceous glands is also reduced, helping to minimise the appearance of pores, and the needle delivery system encourages collagen stimulation. In other words: the treatment is a win-win. After two to six weeks you would expect to see a luminous, plump and healthy looking skin – no Instagram filter or photoshop required. I had my treatment with Clinic 42’s Dr. Joanna Romanowska, and allowed two hours for the procedure, which included time for them to apply a topical anaesthetic to minimise discomfort. The treatment itself can vary depending on the area being treated and can take anywhere from 20 – 40 minutes, and I felt pretty much next to nothing throughout. Immediately afterwards Joanna applied a soothing sheet mask - and then I was on my way. Within 48 hours all traces of redness had disappeared, and within two weeks the result was amazing. The Photo Finish treatment is only available at Clinic 42, 321 Manukau Road, Epsom (see www.clinic42.co.nz for further information) and comes highly recommended.